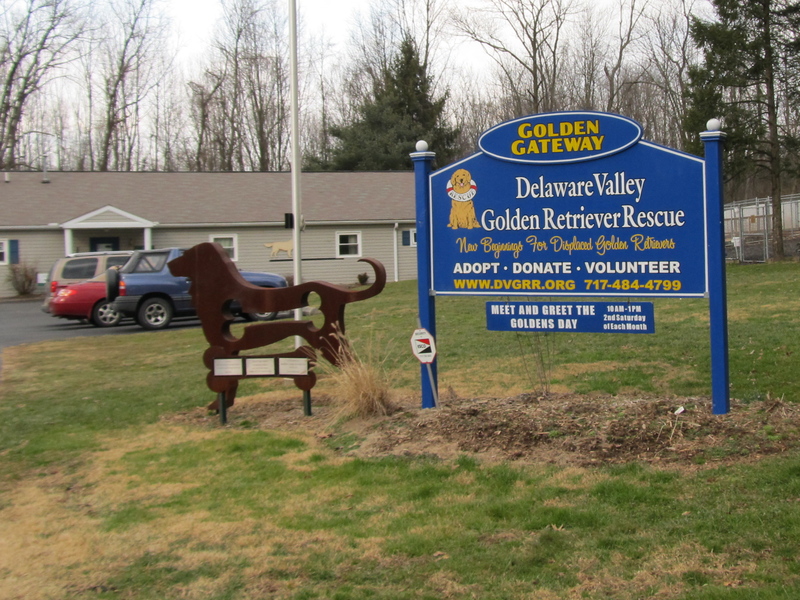 When we pulled into the home of Delaware Valley Golden Retriever Rescue last Saturday, a big question was hanging in the air. 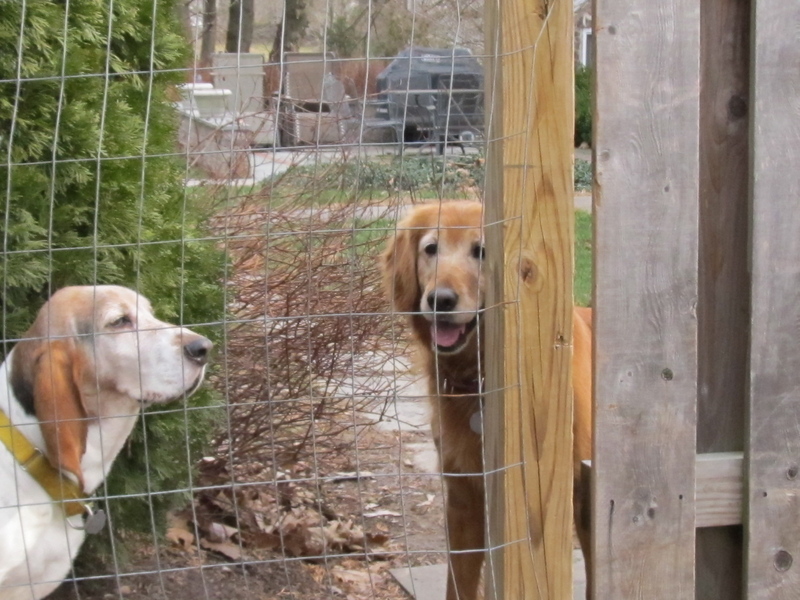 A key factor to consider when adopting a second dog, especially one being rescued from puppy mill purgatory, is how the first dog is going to feel about this intruder. It is a bit like bringing home a new baby, where the older sibling’s reaction can range from a hug to crying to thoughts that are better left unsaid. The people with this rescue organization know this. 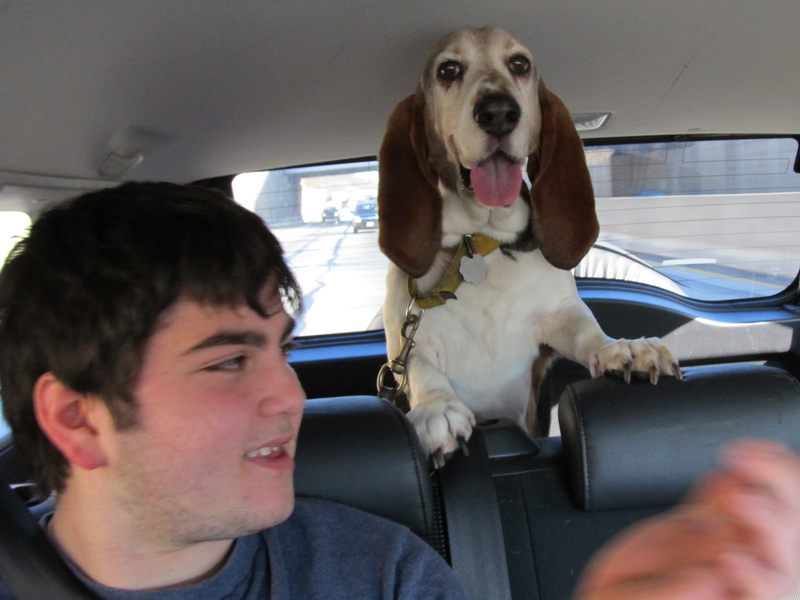 So, they insisted that we bring along our basset hound, Miles, when Clay, my wife and I went to meet the dog they had picked out for us. Miles, who was a rescue himself a year ago, likes his spot on the sofa during the day. He likes his position at Clay’s feet during meals. He likes having first dibs on being scratched under the ears. Hard to know how he would react to a canine buddy. But Clay asked to adopt a stray golden retriever as his Christmas present this year, so here we were climbing out of the car after a 90-minute drive to meet what could be our new family member. If Miles gave the paws up. 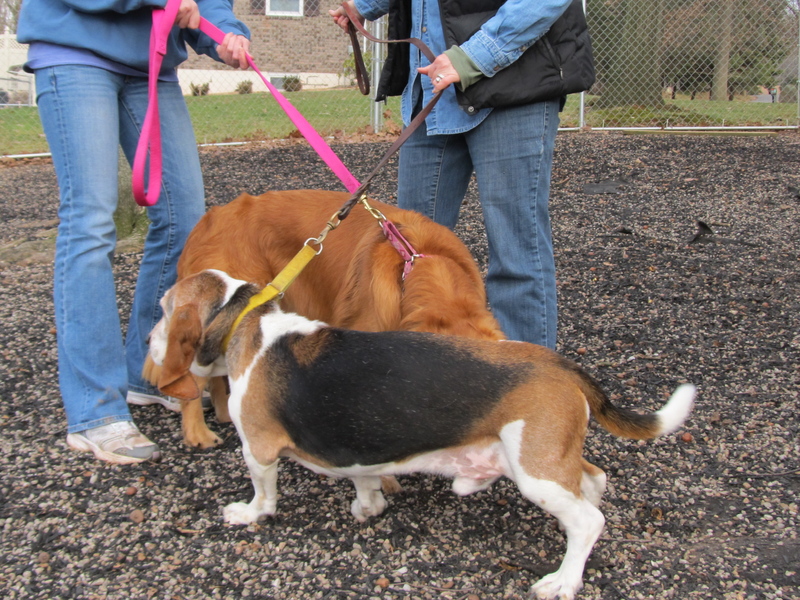 Shortly after arriving, the four of us huddled in the fenced yard at the facility, awaiting our first glimpse of the dog the staff thought was our best match. Then, here she came. She and Miles gave each other the once over, doggy-style, on neutral territory, with Miles not overly thrilled to meet this newcomer that was twice his size. At one point, Miles decided to join Clay on the relative safety of the platform in the middle of the yard. The first, and most important, vote went to Clay. My wife got out his iPad so he could type his thoughts. One down. My wife and I certainly approved. 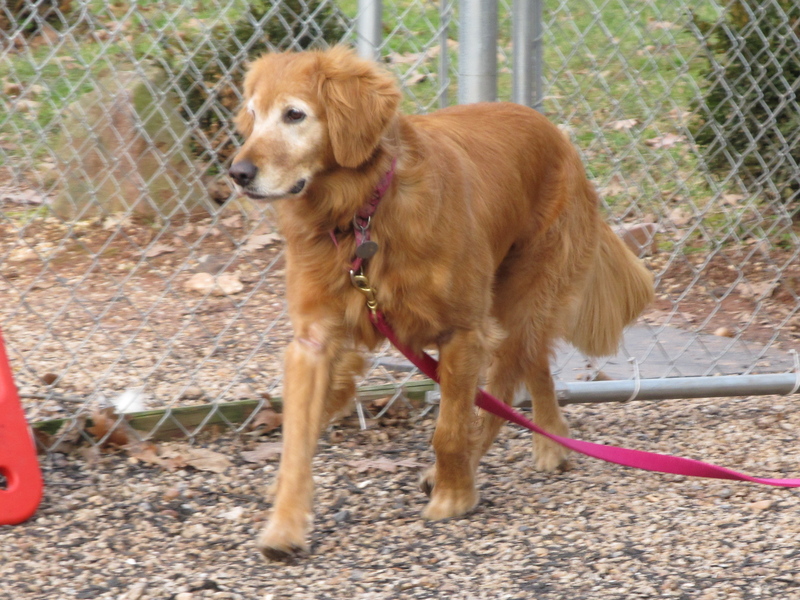 With her reddish-golden coat and regal and calm bearing, she was a graceful beauty. We already knew her history of six years in a rabbit-hutch-size cage turning out litter after litter with no human contact. We knew her fear of doorways. We knew how timid she was around people. Miles was like that at first, too. We knew we wanted to provide her with the home she has never had. After the early sniffing-each-other-out period and a spirited battle to see who could pee the most times on the same spot, Miles and this potential new buddy seemed to get along fine. The decision was made and the paperwork signed. As we loaded our new family member into the back of my car, Miles—who normally has to be lifted up to get in—jumped onto the front seat by himself. No way he was going to be left behind. At home that night, the newly named Cassie (Clay’s choice) went through the usual struggle to settle down in a new environment, pacing incessantly, unsure of where to sleep, how to get outside when needed, what do with herself in general. Miles was little help, snapping at her when she tried to go under the table during dinner, chasing her in the backyard to let her know that this was his castle and he was the king, the big cheese, the head honcho, the top whoofer, lord of the realm. And she better not forget it. We left them to work it out and are happy to report that by Monday, Miles could be found on his usual throne-like spot on the sofa with Cassie contentedly asleep just below him. 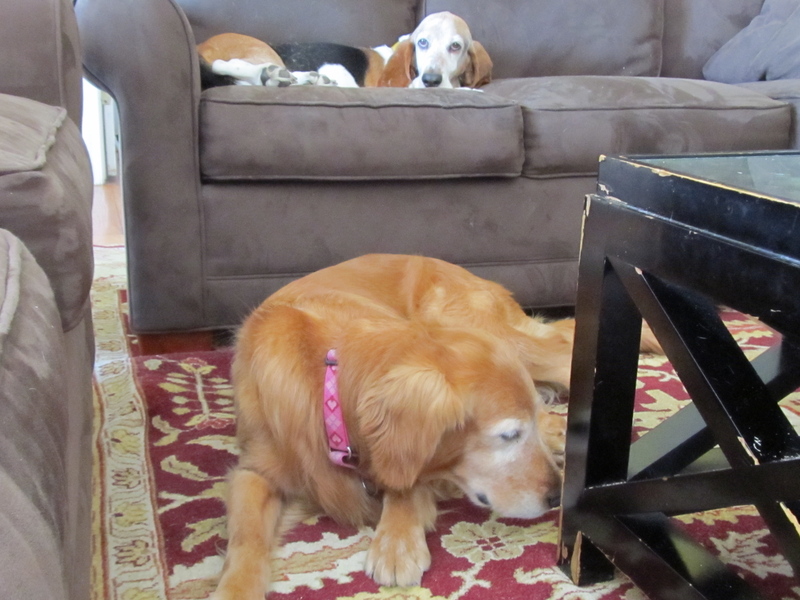 Quiet Cassie is still spending a lot of time by herself in our family room, keeping an eye on us from behind the coffee table. She is venturing out more frequently, though, and accepting being petted and groomed. She hasn’t yet lifted her tail from between her legs, but we know that will come. These things take time, and we are in no hurry. What does Clay think, so far? “she is stupendous,” he typed. Welcome to the family from all of us, Cassie. We’re glad to have you. Even Miles, even if he is not ready to admit it, yet. This entry was posted on January 13, 2012, 8:09 am and is filed under Communicating, Daily Life. You can follow any responses to this entry through RSS 2.0. You can leave a response, or trackback from your own site. Cute! Thanks for sharing the full story! She is such a sweetheart! I think she has made a great addition to the family already! Clay was right, she does have a gentle and pleasing way. I have never seen a dog bring such peace with them when they walk into a room. Good choice Clay! Beautiful entry! Cassie is an angel and I’m so happy that she is with your family! And wonderful choice of the name “Cassie”, Clay! Oh, I am so happy for you all! What a true joy to rescue this beautiful dog, and I am sure that Miles and Cassie, with Clay’s help, will work things out to be okay! Enjoy! Looks like there is a lot of love to share in your family. Thank you for helping another of God’s creatures to have a good life. Love to all of your family. Cassie is beautiful and so lucky to join your wonderful family. You guys make the rescue thing look easy – I may be tempted to try it someday! Such a lovely Christmas wish, Clay! Loved this (particularly that last shot!). 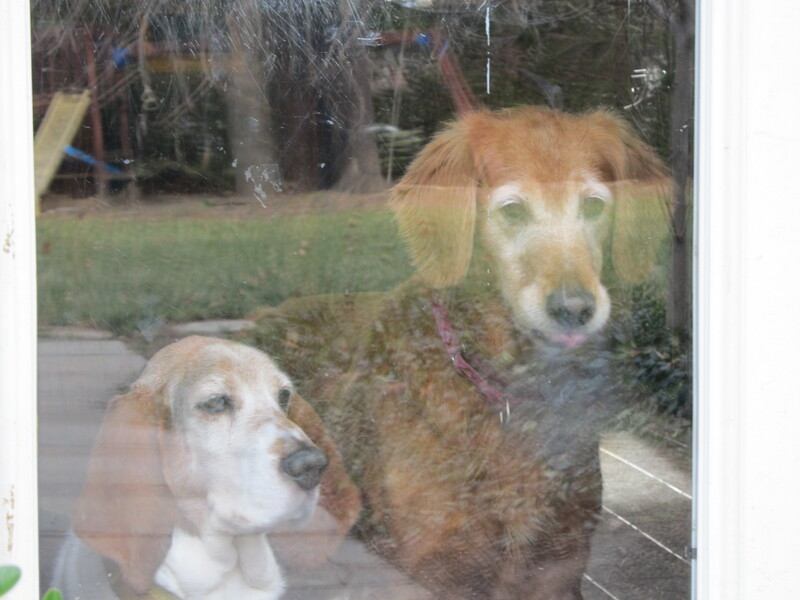 My mom has taken in rescue dogs for years, it is so fulfilling for both parties. Good for you and your family! Look at how happy Miles is! I found him abandoned while house hunting a year or so ago in Asheville, NC. 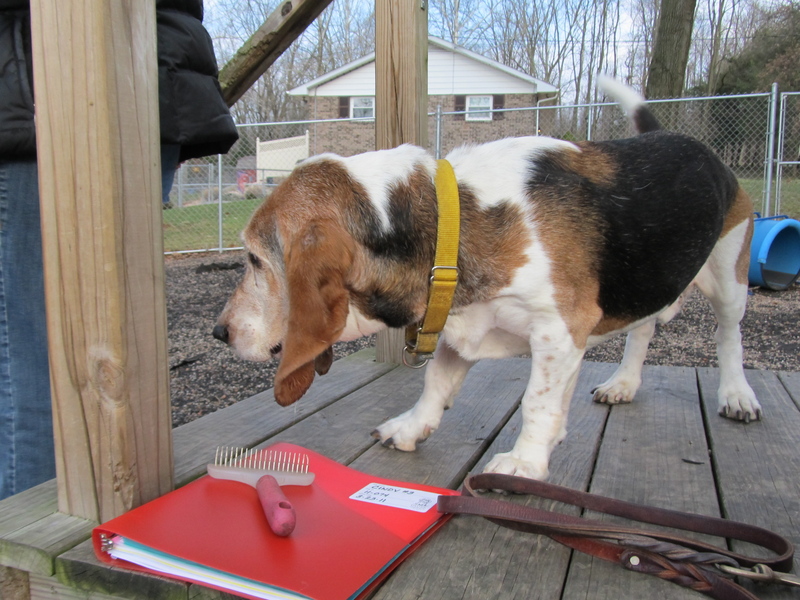 Tri State Basset Rescue worked miracles, meeting us half way. Your writing is beautiful, and your family has so much love to give. He couldn’t have asked for a better home and deserved nothing less. Best wishes. Thanks for your kind thoughts, and for rescuing Miles from that house. With his floppy ears, bouncy walk and unending need for affection, he has brought a tremendous amount of joy (and slobber) into our home. He’s a little on the bossy side, but has proven to be a good companion for Cassie and for Clay.